Bar code printed plastic Identity or access plastic ID cards permit keyless data entry into the application thus quickly identifying the holder of the card in a fast and error free manner. Once the application has identified the correct person then the central database can hold all the history and details of the card holder. These are the simplest and most cost effective from of Autoid attendance control system. These can also be used for loyalty of pre-paid cards application to quickly identity the card holder. Bar codes can be in differerent formats and standards. Some of the common bar code types are 2 of 5, 3of 9, EAN, Codabar,etc.For secure applications bar codes can be either concealed to prevent photocopying or they can be scrambled to ensure complete secrecy. 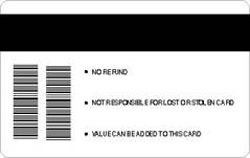 Barcode plastic ID cards and magstripe cards are both equally efficient methods and can be used to equal effect. Bar codes however score marginally in that they can be read of a wand without physical contact.